Have you ever heard a band coming from Islamic Republic of Iran? After many years in this �business� I think it is my first encounter with any metal coming from this Asian country. As my primary job is to remain objective and without any prejudice I�ll try to write a few words on this first ever Iranian Black Metal project. Sorg Innkallelse is one man band/project coming from the ancient and beautiful city of Isfahan. The band name means �Grief Summon� and it is taken from Scandinavian languages. For a couple of years ago the band signed a contract with Estonian based Hexenreich Records. The music is pagan and freezing dark black metal with lyrical themes raging from darkness over hate to nature and anything in between. I have never expected in my entire life that I would listen, yet even more enjoy, an evil black metal release like this. It is perfectly executed with some interesting guitar parts and with addition of some acoustic elements too. The vocals are cold, deep and melancholic yet the whole atmosphere surrounding it is atmospheric and quiet enjoyable. The only thing I don�t like is drum-machine which to times simply sounds annoying. This nine tracker disc is limited to 299 copies only, so if you want to get your hands on this rare cold, pagan black metal spiced with some eastern folk influences it is time now. Neithan: Despite the fact that the name Sorg Inkallelse sound spretty nordic, we are dealing with a band hailing from an area from which you don�t see a lot of metal coming: I am speaking of Iran. Oh well, according to former president Bush Iran was part of the axis of evil, so perhaps it is logical to produce grim black metal in this country. This album, ��Night Black�, was still recorded in the old line-up: Murkmyth on vocals and all instruments, and Sadsoul for guitars and programming. 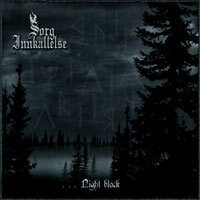 As Sadsoul left the band after recording the album, Sorg Inkallelse nowadays consists of just Murkmyth. The music: it is raw black metal, in the style of the rawer USBM bands, but with a slight pagan touch, some acoustic breaks and melody lines that take us back to the roots of all, the eighties heavy and speed metal. Although the ideas are on occasion quite refreshing (the melodic aspect sometimes reminds me of Windir) I do have some remakrs about the performance itself. The fact that the sound is rather shallow is something I won�t hold against the band, as it seems difficult enough to record a metal album at all in Iran, let alone a black metal album� No, my objections are for one mainly towards the programming of the drums, as they are tuned and programmed too simple, which makes the music sound more simple than it should be. But hey, try to find a good metal drummer in Iran: if I hear how many difficulties befriended bands over here in the western society have finding a suitable drummer, imagine how it will be like in Iran! In all honesty I would not have expected this level coming from a country in Iran at all. Another thing missing compared to other releases within the genre, and that is not just because of the shallow production, is a cold, malicious atmosphere crawling from the album�s grooves. The vocals in itself do rasp as should be, but the instruments don�t feel �connected�, and because of that I miss the right atmosphere to lift it to a next level and to ensure that Sorg Inkallelse is regarded as more than a curiosity because of the country they come from. This �� Night Black� doesn�t scare me, and that is a basic need for black metal.